2017-18 ARTBA Chairman Matt Cummings of AECOM and WTS International Chairwoman Maggie Walsh of HDR sign the MOU. 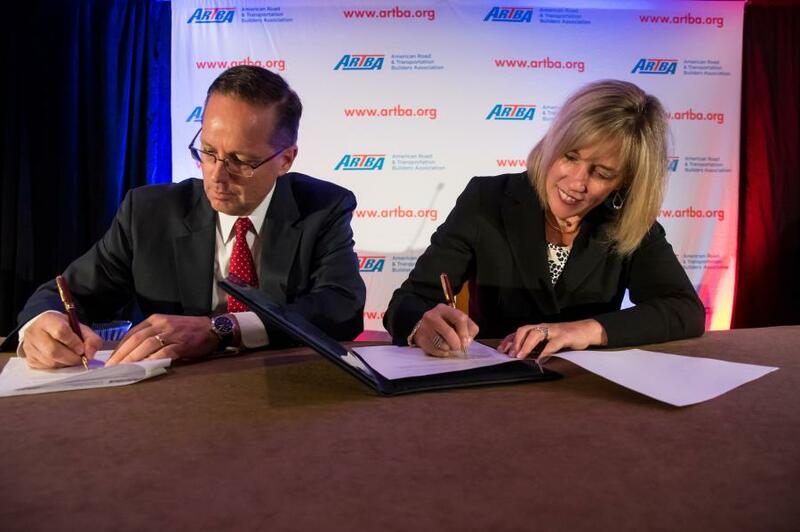 The American Road & Transportation Builders Association (ARTBA) and the Women's Transportation Seminar International (WTS) have formed an alliance to support and advance women in the transportation infrastructure sector. The organizations signed a memorandum of understanding (MOU) in early October at ARTBA's National Convention in New York City. “ARTBA looks forward to working with WTS to promote the development and advancement of women in the transportation design and construction industry. Through this MOU, we also hope to help drive an increase in the number of women entering the transportation workforce,” said AECOM Executive Vice President Matt Cummings, who served as 2017-2018 ARTBA chairman and championed the agreement. “The MOU between WTS and ARTBA signifies the importance of promoting the many facets of the transportation sector as a rewarding career choice for women while furthering their participation, skill sets and careers to ensure the sector's future success,” said Maggie Walsh, an HDR vice president and WTS International chair. Cooperate with others who share these objectives to achieve them. ARTBA and WTS will support each other in the development of content for meetings and conferences, including identifying speakers, opportunities for jointly sponsored workshops, webinars and meetings, publicizing each other's events, and supporting mentoring programs. WTS is an international organization with more than 6,500 members in 79 chapters working to help advance women's careers in transportation through professional development, encouragement and recognition. For more information, visit www.artba.org.